The S/DHUTF top-mount hanger is designed to carry joist loads to a CFS stud wall through two layers of 5/8" gypsum board (drywall). This hanger installs after the drywall is in place and comes in sizes that accommodate most typical joists used in multi-family and commercial construction. A submittal/substitution request for S/DHUTF top-mount drywall hanger for cold-formed steel construction. Designer shall ensure that the joist member adequately transfers load to the hanger. Tabulated loads assume (2x) 5/8" Type X drywall attached per IBC. 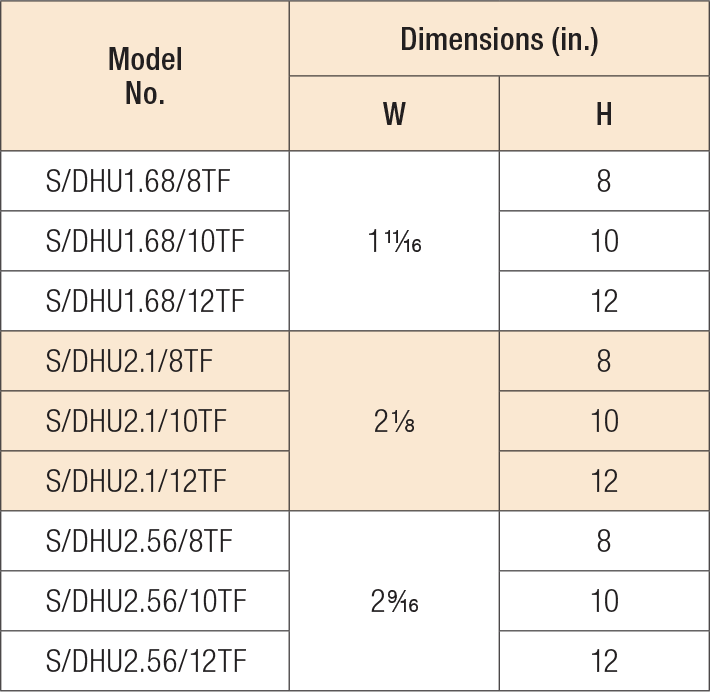 Wall studs designed per Designer specifications. At a minimum, the assembly must consist of 600T350-68, Gr. 50 ksi top track and 600S162-43, Gr. 33 ksi wall studs spaced at a maximum of 24" o.c. Tabulated loads are based on testing with full bearing of 3 15/16" hanger top flange. The minimum joist gauge is 54 mil (16 ga.). S/DHUTF hanger can be installed 3/4" max. from the center of the vertical stud per the in-line framing specifications of the AISI General Provisions without load adjustment. S/DHU1.68/10TF No evaluation report listing. S/DHU1.68/12TF No evaluation report listing. S/DHU1.68/8TF No evaluation report listing. S/DHU2.1/10TF No evaluation report listing. S/DHU2.1/12TF No evaluation report listing. S/DHU2.1/8TF No evaluation report listing. S/DHU2.56/10TF No evaluation report listing. S/DHU2.56/12TF No evaluation report listing. S/DHU2.56/8TF No evaluation report listing.